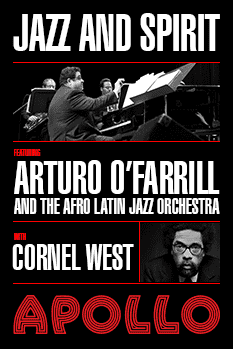 What happens when multi Grammy-Award winning composer Arturo O’Farrill and virtuosic speaker, scholar and activist Dr. Cornel West work together to explore the deep connection between jazz and spiritual traditions? You get The Cornel West Concerto – a work specially commissioned by the Apollo Theater that will have its world premiere with O’Farrill’s Afro Latin Jazz Orchestra at the Apollo on May 21. Tonight, join us for a special preview conversation as the two discuss jazz, spirituality, and the process of working together. The conversation will also feature performance excerpts by O’Farrill and members of the Afro Latin Jazz Orchestra. Hosted by WQXR’s Helga Davis.